** My friend Jean Rabe is on a blog book tour for her upcoming new mystery, The Dead of Night. Be sure to check it out! See all the post links here. In it, she underlines the importance and value of dogs, which she also includes in her upcoming book. Yes, even the infamous Lizzie Borden had dogs, namely three Boston Terriers, which also were a "fashionable" breed at the time. Well, someone who loves dogs can't be all bad... right? It is one redeeming quality, though someone might say that despite having but a few loyal friends and staff, Lizzie still had to be lonely. She was acquitted of the crimes a year after the horrific 1892 axe (hatchet) murders of her father and stepmother, but she remained a social pariah. Not convicted, but guilty nonetheless. 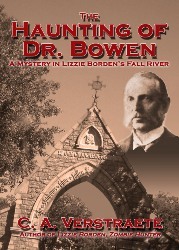 This year marks the 125th anniversary of the Borden murders. Even Lizzie and her sister had a falling out and never talked again. But she had her dogs. They are buried in the Pine Ridge Pet Cemetery in Dedham, MA. 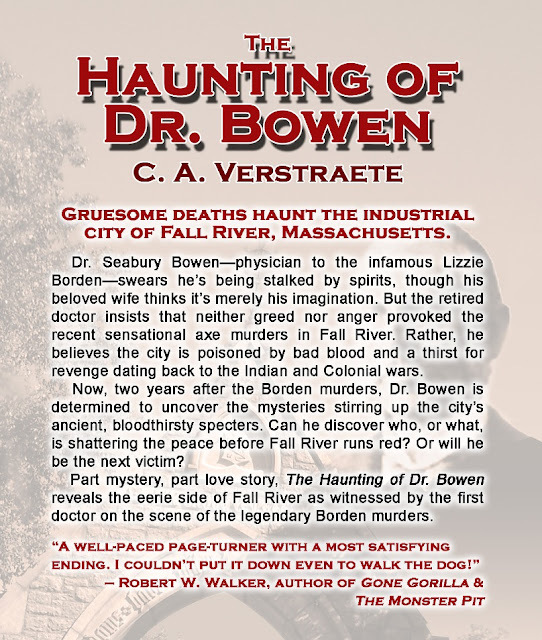 Since I based my book, Lizzie Borden, Zombie Hunter, on the real life events, trial, and some of Lizzie's life after she was acquitted, I naturally had to put a dog in the story. 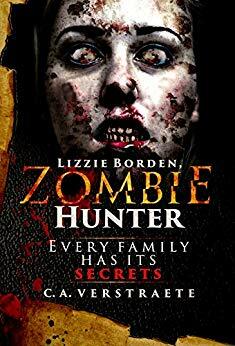 Oddly enough, once the actual danger passed and those who had left in the height of the attacks began returning to their homes, Lizzie soon learned that her former status as the local pariah had not changed a whit. When she took the dog for a morning walk down the street, any neighbors who appeared outside at the same time pretended not to see her. They turned their backs on her or hurried inside. It hurt, she had to admit, and soon she confined her outdoor excursions to her gardens and the area around her own house. She and the dog had to be content in their own backyard. New! 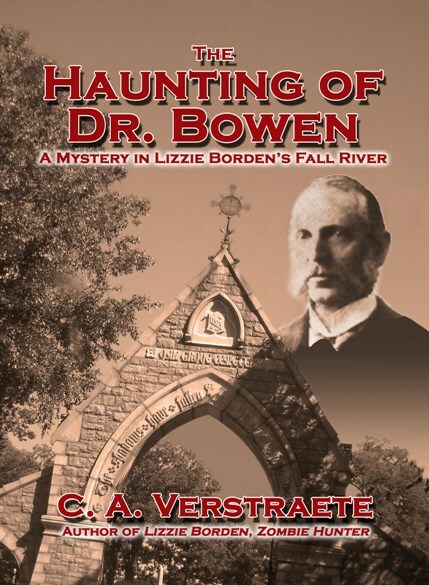 Haunting of Dr. Bowen #Mystery Book Trailer! This is cool! I now have a new book trailer for The Haunting of Dr. Bowen, A Mystery in Lizzie Borden's Fall River. Or here's the YouTube link. Thanks to Julien Saindon of JM Trailer Productions! See below. Here's more about the book, available in print, Kindle and Kindle Unlimited - buy it here. 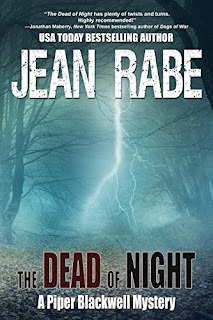 Jean Rabe #Mystery Dead of Night Blog Tour! Putting a name to the skeleton on the bluff, and searching for the thief who robbed the old veteran of his life’s earnings, sends Piper delving into the sleepy towns that dot her rural county. Now she’s digging into pasts perhaps best left alone. Uncovering fragments of Spencer County’s history could prove more dangerous—and deadlier—than she ever expected. Piper Blackwell, four months into her term as Spencer County Sheriff, is hot to solve a cold case. Rain, late at night, bones on the bluff…wonderfully eerie, and something to vex my favorite sheriff with. The book is The Dead of Night, the second in her series, and it is set for a September 15 release by Imajin. Her previous outing, The Dead of Winter, started with her first day on the job. Piper is twenty-three, and won the sheriff’s race by campaigning on her last name. Her father, Paul Blackwell, had been with the department thirty years and had several turns at sheriff. Some in the county think folks didn’t realize they were voting for a different Blackwell. There’s still some friction in her department—over her age and lack of experience, but there’s also growing respect for the Army veteran. She has many of her supporting characters from the previous book—Chief Deputy Oren Rosenberg; Coroner Dr. Annie Neufeld; Teegan, a quirky Goth dispatcher; and Nang, Vietnamese caterer and quick stop owner…and potential love-interest. But there are some new ones thrown into the mix. Series feel good because you can share the action with old friends. They’re like comfortable shoes that you’ve broken in just right. Though while there’s a sameness, Piper and Spencer County keep the story fresh. There are a lot of differences from the first book. What makes this book dissimilar? Piper’s had a few months to grow into her role of sheriff, has become more familiar with her deputies and local politics, and has started to hear the county’s heartbeat. Oren’s had a few months to adjust to the young sheriff; he claims he still doesn’t like her, but he tolerates her…and that’s a big step from the first book. In this tale she’s involved with some of the little things that are a big deal to the rural residents, such as drunk drivers and an unbalanced octogenarian that is hell-bent on destroying mailboxes. She also nabs that cold case—and who doesn’t love a mysterious death from decades past? There are few characters that readers should both love and hate…the drunk on a tractor that annoys the young sheriff. Drunk driving is the number one ticked offense in Spencer County; I figured I needed to address that in the book, putting a little spin on it. The Mailbox Mauler is another such soul. She was inspired by someone I know who has a vicious streak involving mis-delivered mail—downright NASTY; I had to vent by putting it in a Piper book. If the Mailbox Mauler feels real…it’s ‘cause she sort of is. 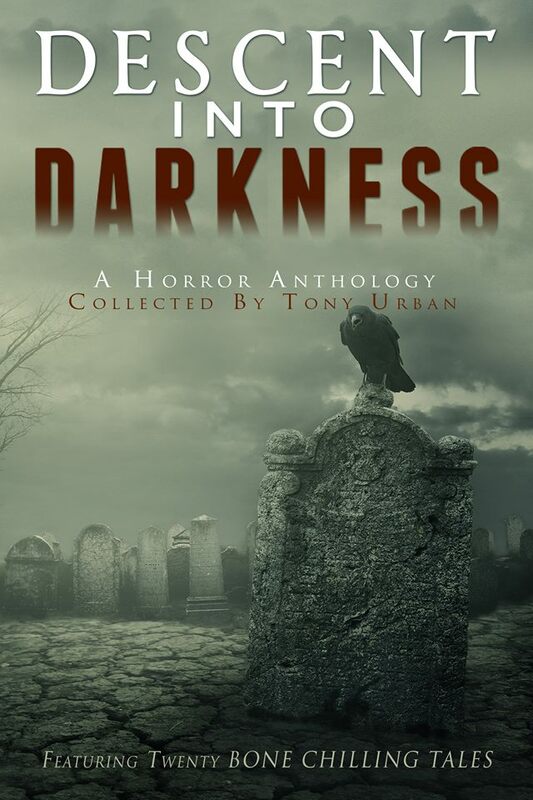 The Dead of Night was inspired by lots of things…among them three Navy veterans who live in a senior apartment complex; I rolled them into one character called Mark the Shark. He opens the book, and I hope the readers love him as much as I do. It was also inspired by the woman in my neighborhood who goes postal, by the drunk on the tractor who needed to be there so I could correctly write an airbag scene, and by an old skeleton because I’d read a forensic book about bones and wanted to put some of that knowledge to fictional use. Is there someone to root for in Piper’s second outing? Absolutely…Piper, of course; she’s determined and feisty, and maybe she’s falling in love. Oren because he’s driven and proves that age in an asset, not a hindrance. Mark the Shark…because he’s Mark the Shark. There are also some folks to root against, but I don’t want to spoil the plot. It was a big red Case tractor, double wheels on the back, hitch, with a raised disc harrow attachment used for cultivating the ground prior to planting—all of it caked with dried mud and in need of washing. Piper was stuck behind it on 66, on her way to Hatfield, an unincorporated dinkburg where Mark the Shark lived. Piper figured this ten-mile endeavor would take her an hour away from her cold case…fourteen minutes to Mark’s, fourteen minutes b ack, and a half hour at the bank or looking through his records to show him the bookkeeping error and ease his conspiracy fears. But the tractor was fouling her time-frame. It belched fumes; her windows rolled down, the stink wafted inside and made her eyes water. It was noisy; overwhelming the oldies station she’d had on and just now clicked off. It was slow, riding in the center of the road, impossible for her to pass on either side without risking the ditch. And it wasn’t traveling straight, sometimes in the proper lane, sometimes veering into the left lane. Usually it held to roughly the middle. The driver raised his left hand and flipped his middle finger. “Really?” Piper stuck her head out the window and hollered: “Pick a lane!” Then thinking he might not be able to hear over the racket the tractor was making, she used the PA in her car. The tractor wobbled farther right, then left, shuddered, and went faster still. Thirty miles an hour. Then the driver tossed an empty whiskey bottle off to the side of the road. ** WINNERS - Joan, ebook & bn100 for paper. Congrats! There’s a tour-wide giveaway for Cracker Barrel and Starbucks gift cards or a little password book. In addition, two lucky bloggers will be chosen at random to win a Starbucks or Cracker Barrel Gift card. Open to US residents only. Also see direct link to giveaway. Jean Rabe’s The Dead of Night Blog Tour runs August 21st thru September 15th. Follow tour stops below to check out the reviews, excerpts, Q&As, and to enter the giveaway! 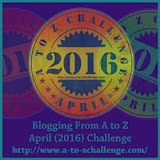 Get all the blog stop links HERE. Jean Rabe #Mystery Dead of Night Book Blog Tour Begins! There's nothing more fun than following along in the excitement of a new book coming out! This is the sequel to The Dead of Winter. - See today and this week's blog links below! And if you think, oh, boring.... well... there are prizes and stuff, too, you know. And... this book is the furthest from boring you're gonna get!! Here's this week's schedule. ** Come back to my blog here Wednesday and/or at my website blog for the 8/23 stop. All the blog stops are here. Jean Rabe’s THE DEAD OF NIGHT Blog Tour and Giveaway! Jean Rabe’s The Dead of Night Blog Tour runs August 21st thru September 15th. Follow tour stops below to check out the reviews, excerpts, Q&As, and to enter the giveaway! While you're out shopping for school supplies, add a GOOD BOOK to your shopping list! MORE Fantastic Reads to Dive Into!! NOTE: Prices were valid at time of blog. Check for any changes. 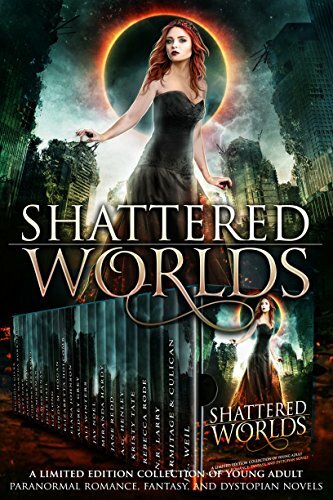 Shattered Worlds, various authors set- Escape into 23 epic worlds that will leave you breathless. From dystopian nightmares to gorgeous steampunk and fantasy settings to fairy-tale retellings and beyond, SHATTERED WORLDS has every story you've been dying to get your hands on! The Dead of Night, Piper Blackwell Book 2, Jean Rabe - As Sheriff Piper Blackwell rushes to a clandestine meeting with an aging, paranoid veteran who believes spies are trailing his every move, she is caught in a fierce thunderstorm. Pounding rain drums against the bluff, washing away the earth and revealing a grisly secret someone tried to bury a long time ago. 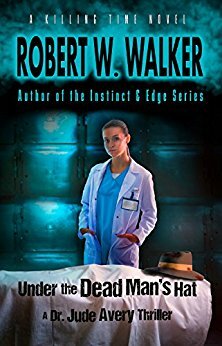 Under the Dead Man's Hat, Dr. Jude Avery Thriller, Killing Time Book 1, Robert W. Walker - Two Chicago and Cook County, Ill. medical examiners team up to go after the most depraved killers in the city. Now they're headed to LA, on the heels of a killer who's filmed and uploaded his horrors. Now the investigators must rely on their weapons and their skills to stop evil in its track. ** Get a new LIZZIE BORDEN, ZOMBIE HUNTER story -- and in all, 20+ free zombie-apocalyptic samples, books, novellas and short stories. WOW!!! Upcoming Zombie Anthology - Cover Reveal!! Keep the Date Open! 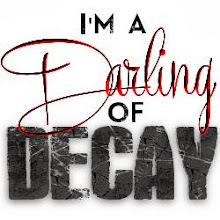 The Reanimated Writers Group on FB is having a cover reveal party for a new, upcoming zombie anthology, Undead Worlds, at 7 p.m. EST, Sept 9 to 12 p.m., Sept. 10. Visit the FB group HERE. I'm reading an arc of Scott Kenemore's latest, Zombie-In-Chief: Eater of the Free World, A Novel Take on a Brain-Dead Election. Kenemore, author of Zombie, Illinois (a funny take on Chicago politics), has the 2016 election pegged dead-on when "The Tycoon" wins the election. His "secret?" He's a zombie! 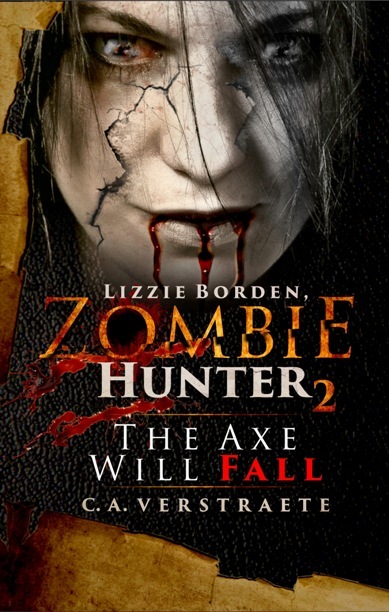 It's like reading about the real-life events - but with zombies and strange twists. Stranger than real life? Well... read it and see! Reminder! 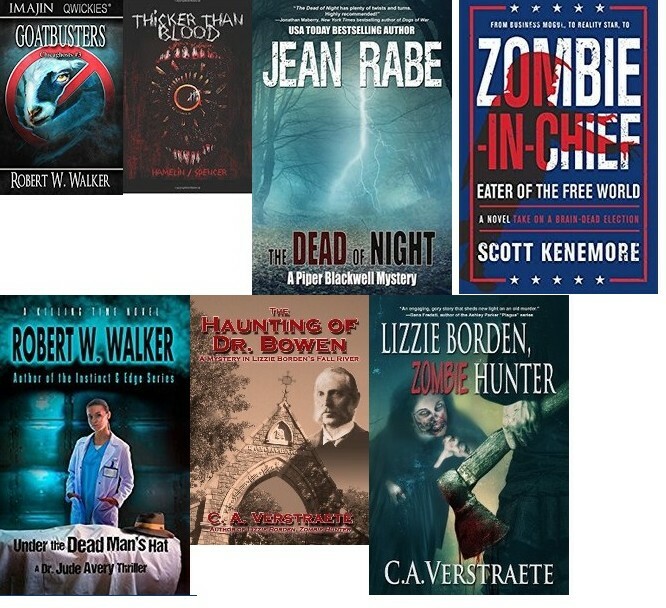 Free #Apocalypse #zombie #Horror Books! 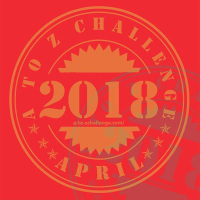 Today: Authorfest! 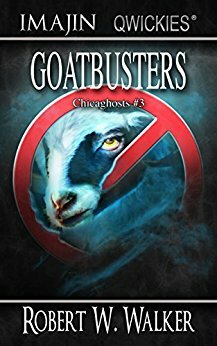 35 authors! Food! Music! Humanity's Hope Has Been Published!